The analysts from Chernovetskyi Investment Group (CIG) have prepared an overview of the online food delivery market in the European and CIS countries, which includes data on the largest players, market dynamics in different countries of the region, as well as key trends. The number of Europeans using order and food delivery services reached 60 million by 2017. With that, the total consumer market amounted to $ 7 billion. This is evidenced by the review data of the European ready-made meals delivery online-market, prepared by the analysts from Chernovetskyi Investment Group (CIG). Experts note, that the business model in the area of food delivery in the countries of the former Soviet Union has changed significantly. Previously restaurants tried to attract customers by creating their own applications and sites, and now more and more restaurants use aggregators that provide a broad customer base and can provide services of their own couriers, call centers and customer support. It is with this model local markets begin to develop. "Today CIG portfolio includes an investment in the delivery service Zakaz.ua, as well as the largest Ukrainian food delivery service EDA.UA. In addition, recently EDA.UA service has merged with the major food delivery player operating in Baltics - FOODOUT. As a result, such merger created one of the largest food delivery companies in Eastern Europe, FOODOUT GROUP. In view of this, it is important for us to study and analyze the trends in this segment. I am sure that online services have huge potential both in Ukraine and in the global market. And there is a place for new interesting projects and solutions," said the managing partner of Chernovetskyi Investment Group (CIG) Volodymyr Kryvko. The full text of the review is in the appendix. The development of information technologies has led to the emergence of new types of business in already established industries. Creation of online services, such as online booking, online orders for ready-made meals and food, forms a new business area - the web-market, which, in fact, is a superstructure to the existing offline markets. At the same time, the development of these services and their accessibility to customers improve the very "primary" industry. For example, Uber, a company working in the field of taxi service, was able to improve communication between the taxi drivers and the clients. Although the very essence of the service has not changed - the driver still drives his customer to the destination, but the order format and the contact forms have changed significantly, aggregating service providers into a single base, which helps to change the customer journey, improve service quality and accessibility. Similar changes occur in the segment of ready-made meals delivery. Over the past decade the global ready-made meals delivery market has undergone quantitative and qualitative changes. Online product sales market is growing rapidly from year to year. According to our forecasts, only in Europe the number of people using food order and delivery services reached 60 million by 2017, with a total consumer market of $ 7 billion. At that, Britain, Germany, France and the Netherlands occupy 76% of the European segment of ready-made meals delivery. And such indicators are not the limit. Factors, which are the drivers of this industry, remain the same: the growing level of Internet penetration and the improvement in the supply chain. 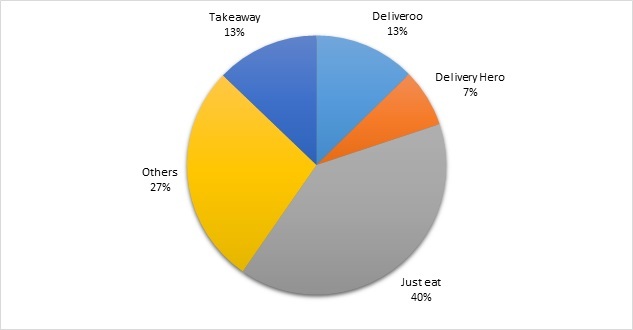 As for the structure of the market in this segment, according to the statistics, which we have collected, 73% of the food delivery segment is occupied by Just eat, Delivery hero, Deliveroo and Takeaway. The remaining market volume is distributed among small regional companies, which operate only in local markets. For example, Delivery club is the obvious leader in Russia, WALT - in Finland, but their strategies are focused only on strengthening their positions in the current market and the shares of these companies do not exceed 4% in the overall structure. Diagram 3. 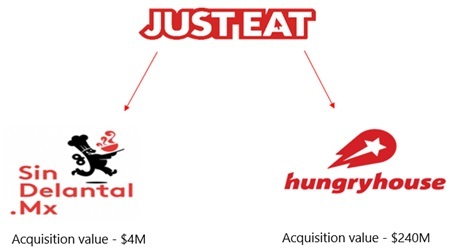 Financial activity of the company "Just eat"
There is also a certain gradation between the players, depending on the model of service delivery. For example, the companies Just eat and Delivery Hero have created an application through which a customer can order a dish, but the delivery is carried out by a restaurant. The model used by Deliveroo and Foodpanda can be defined as more autonomous: in addition to the application, these companies use their own courier services. Of course, these models are variable in risk and profitability. In general, the trend in this industry is to consolidate the leading companies by buying small competitors and regional players. Diagram 4. Investment activity of the company "Just eat"
A slightly different situation is observed in the post-Soviet markets. They traditionally lag behind the foreign ones both in revenue and in the number of users. The analyzed segment was not ignored by this pattern. First of all, the reason for the lagging is the relatively low Internet penetration level, as well as the volume of the e-commerce market. In the CIS, in general, the situation is heterogeneous, and if in one region the industry only begins to develop (Azerbaijan), in others it smoothly enters a relatively mature phase, with established rules and a definite structure of players (Russia). According to Euromonitor, the volume of ready-made meals delivery market in Russia in 2016 was $ 280 million. The capacity of the Ukrainian market is much lower: in 2016, according to expert estimates, the segment of food delivery was $ 97 million. Also, the existence of one obvious leader with a huge share in the occupied market is the distinctive characteristic of this segment in this region. For example, Delivery club is such in Russia, EDA.UA - in Ukraine, Сhocofood - in Kazakhstan. The business model in the area of food delivery in the countries of the former Soviet Union has changed significantly. Previously restaurants tried to attract customers by creating their own applications and sites, and now more and more restaurants use aggregators that provide a broad customer base and can provide services of their own couriers, call centers and customer support. It is with this model local markets begin to develop. CIG's analysts have also identified the main trends of segment development in the CIS markets. Following the markets of Ukraine, Kazakhstan and Russia, the other post-Soviet regions began to develop rapidly. Recently, there has been a rapid growth in the Caucasus region - apart from the well-developing Armenia, there is the revival of the industry in Georgia. Also, the Central Asian market doesn't go unnoticed. At this stage, it is in its infancy, but according to SOLVentures, the potential of such a market may exceed Russia's. 1. Local companies have changed business processes, formed at the beginning of the decade. 2. Market competition can be characterized as conditionally monopolistic: in the analyzed countries, 1-2 companies occupy more than 90% of the market. 3. There is a huge potential for the market growth against the background of the food delivery segment development in Western countries. The main growth problem for small companies is the poor customer mobility from one aggregator to another. According to McKinsey, about 70% of customers do not want to switch to another platform, that is, the main growth factor is market underdevelopment, a relatively small current volume. 4. In addition to market development in Ukraine, Russia and Kazakhstan, analysts and investors emphasize that significant growth can be expected from the development of the Central Asian region.